Fall camps are in full swing and the season is only two weeks away. As the season nears, we begin a series to discuss the top 5 draftable players at each position. Today we start as always with the quarterback. The NFL is a quarterback driven league and if you want to have a successful team, you have to have a franchise QB. Here are our top five. Teddy Ballgame is the real deal. He is a throwback to a time when all quarterbacks were drop back pocket passers. Teddy can move around and avoid the rush, but you don’t really fear his running ability. What you do fear is his rocket arm and his laser-like accuracy. He has a quick release and has the ability to throw the ball with just a flick of the wrist. 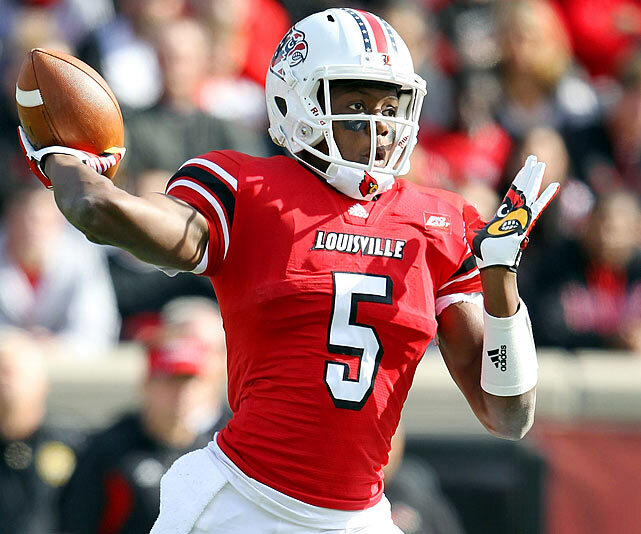 Bridgewater started as a freshman and showed incredible poise and leadership ability. He has an amazing command of the offense, throws a really nice deep ball and has a nice touch on his intermediate passes. If you want to look at his toughness, you only have to look at tape of the Rutgers game last year. The Cardinals needed to win the game to win the Big East Championship and a berth in a BCS bowl. Bridgewater had a sprained left ankle and a broken left wrist. During warm-ups it was decided that he would not start, but after falling behind 14-3, Teddy Ballgame entered the game. Bridgewater limped the entire game, but he rallied his team from an 11 point deficit to win the game and the Big East Title. He completed 20 of 28 passes for 263 yards and 2 TD. It was one of the gutsiest performances I’ve seen. Teddy completed the season by guiding his team to a surprising 33-23 win over Florida in the Sugar Bowl. Perhaps his most endearing quality is that he’s a very humble player that is a team player. He is the antithesis of Johnny Manziel, not seeking out attention and he has decided not to launch an official Heisman campaign even though he is a strong candidate for the award. The Cardinals are loaded at wide receiver and Bridgewater should put up big numbers. Of course he could decide to return next year, but should Bridgewater decide to turn pro, he should be a top 5 pick in the draft. Many people say that Tajh Boyd may be a strong contender for the Heisman this year. He closed the 2012 season with a strong push. Boyd won the ACC Player of the Year honor and was a first team All-American selection. He ended his season by defeating the LSU Tigers in the Chick-fil-A Bowl. Boyd will be looking to continue that momentum into this season. Tajh Boyd is a very dynamic quarterback that can hurt you with his legs and his arm. Clemson runs a very fast paced offense and Boyd is the triggerman that makes it all go. Before the 2012 season, he lost weight which increased his mobility and allowed him to put more pressure on the defense. Boyd does a good job moving around in the pocket and alluding the rush. He is better when he is aggressively attacking the defense. Boyd makes good decisions and does a good job reading the defense and exploiting its weaknesses. Clemson lost some of its weapons to the NFL, but look for them to reload this year. Gone are Andre Ellington and Nuke Hopkins, but they still have Sammy Watkins. Watkins was a freshman sensation in 2011, but got off to a slow start in 2012 and never really seemed the same. I look for Boyd and Watkins to hook up on a regular basis this year and put up huge numbers. A.J. McCarron was the field general for the last two national championship teams. As a sophomore, he was strictly a game manager, but he has grown to be much more than that. Coach Nick Saban has developed a trust in his quarterback and he now allows McCarron to take more chances. His junior QB responded with 30 TD last year with only 3 interceptions. McCarron played well in big games and on the rare occasion that the Crimson Tide trailed, he rallied them to a win. The only blemish on McCarron’s record in 2012 was an interception on the goal line in the final minutes against the Aggies which resulted in their only loss. A.J. McCarron has good mobility, but he isn’t going to scare anyone running the ball. What McCarron does well is move around in the pocket and escape and throw on the run if needed. Alabama has one of the best running games in the country and McCarron feeds off of that. He does a very good job on play action fakes and bootlegs. He has a very smooth delivery and great mechanics. McCarron is extremely accurate and led the country with a QB rating of 175.28. Nick Saban has drilled it into him to take care of the ball and he will take a sack rather than throwing a pick. NFL teams will like a guy that takes care of the football and doesn’t turn it over. McCarron might not be a first day pick, but I would be surprised if the doesn’t go in the 2nd or 3rd round. David Fales may be the best quarterback you’ve never heard of. Fales threw for 4,193 yards in 2012 with 33 TD and only 9 interceptions and he led the country with a 72.5% completion percentage. At 6’3” and 220 pounds, Fales has the size that NFL teams like. Fales has a good football IQ and is a tough player that is willing to take shots. He has a quick release and has good timing with his receivers. The only flaw in Fales’ game is that he lacks a rocket arm. He has nice touch, but sometimes put a little too much air under his passes. The lack of arm strength could just be a mechanics issue that could be corrected at the next level. I like Aaron Murray a lot. He is a 4 year starter that has been the leader of the Bulldogs offense. Up until last year, there was a stigma that he couldn’t win the big game. I think he put a lot of that to bed last year. He had one bad game early in the year against South Carolina, but the Bulldogs finished the year with 6 straight wins before losing to Alabama in the SEC Championship Game. Murray played well against Alabama and came up 5 yards short of the win. He followed that game up with a win over Nebraska in the Capital One Bowl. Murray is very experienced and trailed only A.J. McCarron nationally with a QB rating of 174.82. He is very cool in the pocket and will deliver the ball and take a hit. Murray has a strong arm and is a good pocket passer, but he loses some of his effectiveness if he is flushed and forced to throw on the run. I believe Murray may have the skill set to make the biggest jump of any QB on this list. He has the weapons around him to be successful. Murray can lean on the Gurshall combination of Todd Gurley and Keith Marshall in the running game and he also has a big play receiver in Malcolm Mitchell. If Georgia can have the type of year that many people think they are capable of, I can see Murray’s draft value skyrocketing. Some of you may be asking, what about Johnny Manziel? Manziel was redshirted his freshman season, so he will be eligible for the 2014 draft. I think the drama surrounding Johnny may be too much for some NFL teams. Until Manziel can show that he has matured and willing to be accountable for his actions, I think many teams will shy away from him. You can’t hide behind the excuse of being a 20 year old college kid forever. I also think smart NFL coaches can defend his game. Manziel thrives on creating chaos (both on and off the field). I think Alabama showed late in their game that if you keep Manziel in the pocket, he loses his effectiveness. He has so much speed and athleticism most teams didn’t know how to deal with him last year, but I think that after seeing him once some teams may be able to contain him. There is also the autograph controversy hanging over him. It will be interesting to see how many games he misses this year, if any. This entry was posted on August 15, 2013 by draftmaniacs in Top 5 at each position and tagged 2014 NFL draft, A.J. McCarron, Aaron Murray, Alabama football, Clemson Football, David Fales, Georgia football, Louisville football, NFL Draft, San Jose State Football, Tajh Boyd, Teddy Bridgewater.